TriRhena Bluegrass in Basel, Switzerland, as the first concert shown in the EWOB guide tonight 24th April opens up the very extended European Month of Bluegrass. We are looking forward to welcome bands from the three countries touching boarders in Basel: MoonFire representing Switzerland, The Common Cryers from France and Blue Side of Town running for Germany. This is also the place, where the first EWOB T-Shirts and raffle tickets 2007 will be sold! Make sure to get yours at one of these numerous events, too! It is with deep regret that British Bluegrass Music Association announces the death of Jim Irvine of the Down County Boys. Dave Bresnen, chairman of the BBMA, states that, sadly, Jim apparently had taken his own life, having been found by the staff in a hotel room in London on Wednesday morning 18 April. The sincere and heartfelt condolences of the British Bluegrass Music Association and its members go out to Jim's family, his fellow musicians and many friends. 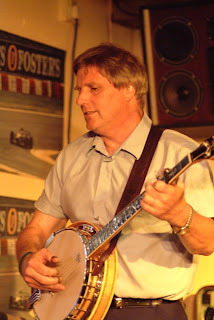 Jim Irvine of Coventry played banjo, guitar, and fiddle for many years with the Down County Boys, longtime holders of the title of #1 British Bluegrass Band. He was also the BBMA area representative for the West Midlands. The above photo is taken from the Cornish Bluegrass Association website. Update 30 April: Peter Parker (the Down County Boys' fiddler) confirms that Jim's funeral will take place on Tuesday 8 May at 3.15 p.m. at Canley Garden cemetery and crematorium, Cannon Hill Road, Coventry, in the Charter Chapel. Flowers should be sent to the funeral directors, Henry Ison & Sons (Coventry) Ltd, 76-78 Binley Road, Coventry, CV3 1FQ; tel: +44 (0)24 76458665. Everyone attending the funeral is invited for refreshments after the proceedings in the upstairs room at the Coventry Working Men's Club in Whitefriars Street, Coventry (next door to the Coventry Boys Club). Here is a map link. The link for a location map of the Canley Crematorium Coventry is here. Rainer Zellner of the Music Contact agency reports that on 5-9 July 2007 the Crooked Jades will represent American old-time and folk styles at Germany's most important and largest World Music Festival - in Rudolstadt, in the beautiful Thüringer Wald region. Also on the bill for a special festival opening 'America' concert on 5 July are Valerie Smith & Liberty Pike and the 'Metal Grass' band Hayseed Dixie, led by the Reno Brothers. The Crooked Jades are also planning another European tour from the end of September till mid October. Full details of the coming European tour by the Wilders (2-28 May) can be seen on their website, on the Music Contact website, or here. Hayseed Dixie are now in the second week of a tour in Britain and north-west Europe which ends on 7 May in Oslo, Norway. Full dates are on their website. A full schedule of the European tour of Dan Paisley & the Southern Grass is available online at the link below. The tour was jointly coordinated by Strictly Country Records (Pieter Groenveld) and A.R.T. Promotions (Angelika Torrie). Don't miss this exceptional band on their tour through Switzerland, Sweden, France, Germany and the Netherlands. The Municipal Cultural Centre of Strakonice, Czech Republic, announces that Jamboree 2007, the biggest bluegrass and country music festival in Central Europe, will be held at Strakonice (about 90 km south of Prague) on Friday 25 May and Saturday 26 May. Friday: Riding Horse Scene, 4.00 p.m. 'The Legends': Tomáš Linka & Přímá Linka, Petr Kocman & the PK Band. Friday: Summer Cinema Scene, 7.30 p.m. First main concert: Flashback, Reliéf, Radim Zenkl Quartet (USA), Eliška Ptáčková & Band, Light Cavalry, Modrotisk, Robert Křesťan & Druhá Tráva with special guest Andy Owens (USA). Saturday: Riding Horse Scene, 10.30 a.m. 'Bluegrass Session No. 7': Wejlet, Giant Mountain Boys, Kvintet, Carrabina, Wyrton, Luňáčkové, Album, BG Company, Burizon, and others. Saturday: Summer Cinema Scene, 4.00 p.m. Second main concert: Vabank Unit, Poutníci, Monogram, Blue Gate, Druhá Míza Vojty Zíchy, Nová Sekce, Madalen, Petr Kůs & Fámy, Petr Brandejs Band, Banjo Duo, Country Cocktail, Stráníci, Cop, Semtex. Rosťa Čapek and Míša Leicht will be the MCs for both evening concerts, and Zdeněk Schwager will be MC for 'Bluegrass Session No. 7'. In the Free Area of the Jamboree there will be horse riding, dance shows, an exhibition of old American cars, and jam sessions. For further details (in the Czech language), see the Jamboree website. The Forge Mountain Diggers old-time band - David Bass (fiddle), Allison Williams (banjo, vocals), and Thomas Bailey (guitar, vocals) - will tour Sweden from 14 September to 5 October 2007. The tour schedule includes shows in Stockholm, Olofström, Tanum, Skellefteå, Örnsköldsvik, Gävleborgs län, Visby, Södertälje, Linköping, Oxelösund, and Eskilstuna. The Diggers are highly regarded old-time musicians. David Bass, in particular, was a member of the Freighthoppers, who recorded two albums for Rounder Records and earned a standing ovation at IBMA's World of Bluegrass ten years ago. Bluegrass Unlimited called the Diggers' first CD, The Forge Mountain Diggers, 'a breathtaking collection... that deserves to be an integral part of any serious music library'. They also have a MySpace site. Read the complete text of this release on the EBMA website. Over the last three years, IBMA has made financial resources available to foster the development of bluegrass music outside of the U.S. Twenty nine grant applications have been funded during that time for a total of $50,000.00. 1) Use IBMA World of Bluegrass events to expose international attendees to professional development opportunities and worldwide connections in the music. 2) Offer direct support to bluegrass professionals and organizational development efforts which foster the music's opportunities outside the USA. Of the total allocated this year, $13,000.00 will be made available as scholarships for World of Bluegrass events (which can be used for registration fees, travel and/or accommodations) as well as other international activities which can be hosted during the convention. The remaining $7,000.00 will be available to fund new bluegrass projects which foster international cooperation and development outside the US. Any IBMA professional member (organization or individual) based outside the US can apply for these financial resources in 2007 and must do so before April 16, 2007. A special International Outreach Committee is responsible for the review process and will make decisions regarding grants by May 31. For a complete set of criteria and application process, contact IBMA at info@ibma.org. Tuesday 1 May: D-74343 Sachsenheim, Germany; in the Schlosshof or Kulturhaus (depending on weather), 7.00 p.m. Contact Muff Musik by e-mail. Wednesday 2 May: Bluegrass Fest, Culture House Zrkadlovy Haj, Bratislava, Slovakia, 8.00 p.m.
Thursday 3 May: Hotel Newland, Klaaswaal, the Netherlands, 9.00 p.m.
Saturday 5 May: 5th International Bluegrass Festival of Bühl, Burgerhaus Neuer Markt, Bühl, southern Germany, 5.00 p.m. and 9.30 p.m.
Sunday 6 May: Oldenburgisches Staatstheater, Oldenburg, northern Germany, 7.30 p.m.
Jason Thomas, formerly a member of Kane's River, will be playing mandolin and fiddle with the band, in place of David Harvey. For more details, contact Karl via e-mail. The Frankfurter Rundschau, a major German newspaper with national distribution, carries an article about the 'rediscovery of bluegrass music in Kentucky' in its weekend edition of Saturday 17 March. The complete article ['Der Sound der blauen Berge' by Frederik Jötten] is now available in the online edition of the paper, at this link. On the positive side: after so many years of near-total negligence by the major media it is nice to finally see a piece of solid and serious journalistic work devoted to bluegrass music, without the otherwise customary sneering or ridiculing side blows. The author obviously was in Nashville during World of Bluegrass week 2006, and was particularly impressed by two aspects: the musicianship and devotion of the jammers and the fact that so many youngsters are getting into bluegrass music. Rounder Europe announce that their latest releases in bluegrass and allied fields of music include Doyle Lawson & Quicksilver, More behind the picture than the wall; Uncle Earl, Waterloo, Tennessee; Donna Hughes, Gaining wisdom; and Linde Nijland sings Sandy Denny. Linde Nijland and Annemarieke Coenders form the popular Dutch duo Yggdrasil. Rounder Europe also now has in the stores A hundred miles or more, a collection of 16 Alison Krauss recordings without Union Station, including her work for the film soundtracks of Cold Mountain and O brother, where art thou? and her collaborations with John Waite on 'Missing you', with Brad Paisley on 'Whiskey lullaby', and with James Taylor on 'How's the world treating you' from the tribute album Livin', lovin', losin': songs of the Louvin Brothers. The April 2007 newsletter of Rainer Zellner's Music Contact agency includes full dates for the Wilders tour (3-28 May), including the festivals at Bühl, Germany (5 May); Willisau, Switzerland (12 May); Radebeul, Germany (19-20 May); Ulm, Germany (24 May); Virton, Belgium (27 May); and Zuidlaren, the Netherlands (28 May). The Crooked Jades will appear on 6-8 July at the Rudolstadt festival in Germany. 'Hillbilly Bluegrass', a touring 'Festival of Authentic Country Music', is announced for autumn 2008. Managing Assistant Kirsten Spiegl; phone +49 (0)7073-913588 (13:30-18:30 p.m.); e-mail. To download promo photos and text, use this link. Gijs Cals of the Sedate Bookings agency reports that the .357 String Band from Milwaukee will make a European tour in October. The first concerts have already been booked. Telephone +31 (0)6 41 77 27 27; e-mail.